Use your air passenger rights in the event of a flight delay, flight cancellation or overbooking. Compensation according to EU regulations. No risk for you: No win – No fee! EU Regulation 261/2004 has not harmonized the rules relating to limitation periods. Therefore the national laws of the member states apply. The limitation periods are between 1 and 10 years. In Germany, it amounts to 3 years. What is EU Regulation 261/2004? EU Regulation 261/2004 is a legal act that provides a clear definition of air passenger rights. See Wikipedia for a more detailed description. Am I entitled to claim if I missed my connecting flight? Passengers who miss their connecting flights are likewise entitled to claim for compensation. The European Court of Justice decided on 26 February 2013 (C-11/11): What counts is mainly the delay at the final destination and not the delay from the departure point or from stopover airports. Flight delays can occur for a number of reasons, from a lack of available crew to mechanical problems. Compensation for delayed flights was established by EU Regulation 261/2004, guaranteeing up to €600 per passenger for flights which are delayed for three hours or more. The airline can avoid compensation for delayed flight claims if they can prove that the flight delay was caused by exceptional circumstances beyond the airline’s control. What is considered an exceptional circumstance is stipulated by each country’s legal system: For instance, in many cases (but not always), if a strike or extreme weather conditions occurred, it will not be covered. How late must my flight arrive at destination airport before I can be eligible for compensation? Flight cancellations can often be the result of aircraft or crew unavailability. In recent years, many airlines have been reducing costs by having less crew and maintenance staff on standby. 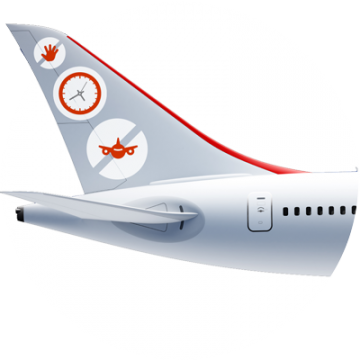 Additionally, they are now operating with less turnaround time (the time an airplane spends at an airport between flights). That means that even the slightest problem with an aircraft or crew can cause a chain reaction across the entire airline’s network, potentially resulting in cancelled flights. Compensation for a flight cancellation is guaranteed by EU Regulation 261/2004. Overbooking is a common practice in the airline industry today. Airlines will commonly oversell a flight (by selling more seats than available) to fill the seats of passengers who do not show up on the day of the flight. This practice, however, creates a problem for a passenger on a flight where there are not enough ”no-shows” and, therefore, not enough available seats even though the passenger’s booking was reserved and confirmed correctly.